With Otto Step your dog can now step easily into the back. No more picking up hind legs! Think of Otto Step as a preventative medicine for your pet. 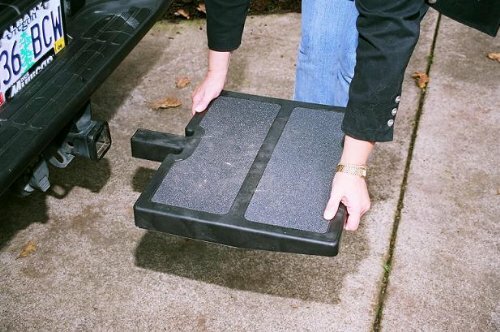 If you have an SUV and a traveling dog then you need "Otto Step". With Otto Step your dog can now step easily into the back. No more picking up hind legs! Think of Otto Step as a preventative medicine for your pet, because it helps prevent injuries caused by jumping down from high SUVs. Constructed from lightweight, durable super strong nylon glass filled plastic that can easily hold over 200 pounds. Easy to insert ignore into any 2" receiver. Only weighs 6 pounds! 18" extension available for pickups and endgates.